Barbara's story is a magnificent LOVE story between her Divine and Human selves... who find each other after many years and become ONE. It is a magical journey that begins with her question Who am I. The more she explores, the more aware she becomes and her mind grows quiet, this allows her to perceive nine Elemental Beings who remind her of her core truths and take her from a world of fear, struggle and limitation into a New Energy Consciousness of love, grace and freedom. In this loving space she observes and feels the natural integration of All of herself, a Loving and Magnificent Master Creator who chooses, expresses and creates heart and soul passion on the physical plane and beyond... beyond imagination, words and everything that is known until now. 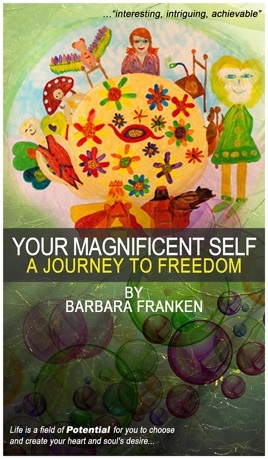 Barbara holds the vision of a Loving and Peaceful New Earth where Humankind, one heart at a time, realise the truth of their own magnificence as they choose to hear their Divine and Loving voice that resides within and allows them to experience a life of celebration, love, fun and freedom. She has released her true story to help inspire others to resonate with their own Magnificent Consciousness... to OWN it and ALLOW their unique and free creative expression to unfold in the heart of life.